Antique 9ct Gold Blue Moonstone Bracelet. Art Nouveau Scottish Gold Moonstone Bracelet. Edwardian 9K Gold Geometric Panel Bracelet. 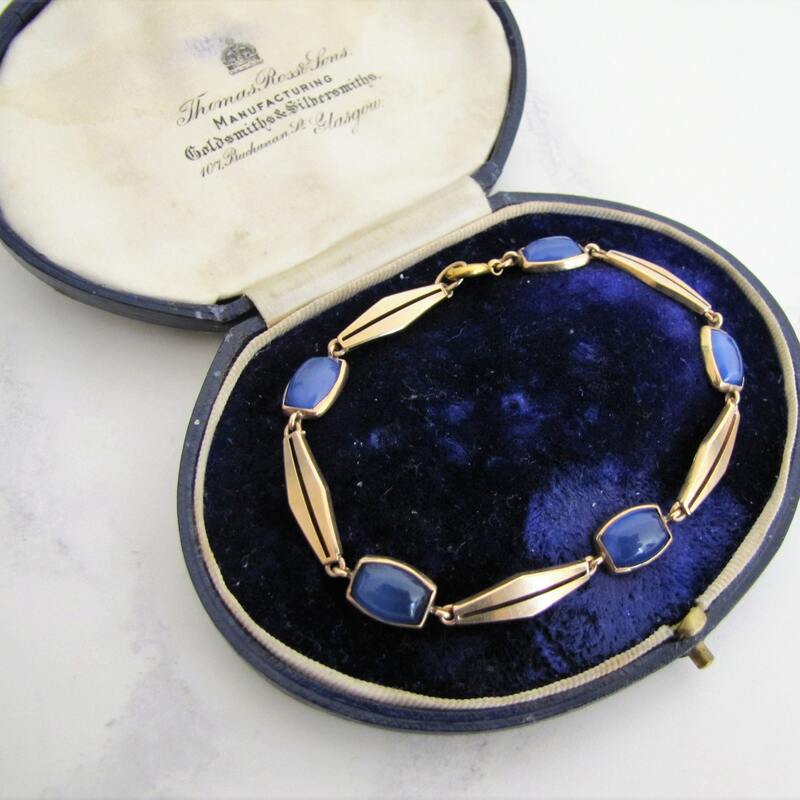 Hailing from a Scottish estate this exquisite antique Edwardian 9ct gold bracelet features five etheral blue moonstones that change color depending on the light, deep opaque sapphire blue transitions into translucent milky pale blue with a violet undertone. The gemstones are cabochon cut in a pillow or cushion shape with domed tops and are bezel set. The bracelet is rendered in a superb Art Nouveau design with the moonstones flanked by long slim geometric gold panels that are gently curved. The gold is solid heavy gauge, not flimsy, and it has turned a beautiful rosy hue with age. The bracelet fastens with a simple unobtrusive spring ring catch that allows this elegant bracelet to really take center stage, absolutely gorgeous! 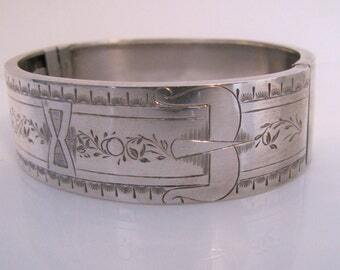 MEASUREMENTS: 7-1/2 inches long (19cm) and 3/8" (8.3mm) wide. CONDITION: Superb with the clasp in perfect working order and no damage to the stones, any dark marks are camera shadow. A fine quality piece and very well taken care of. Please note the blue antique bracelet box shown is not included in this sale but this piece will arrive in one of our top quality presentation boxes. The antique box may be purchased separately, please enquire for details and more photos if desired. Victorian Whitby Jet Stretch Panel Bracelet. Antique Black Mourning Bracelet. Diamond Faceted Jet Stretch Bracelet. Genuine Whitby Jet Cuff. Victorian Pressed Horn Stretch Bracelet. Antique Black Horn Mourning Cuff Bracelet. Embossed Bas Relief Oak Leaf Moulded Panel Bracelet.